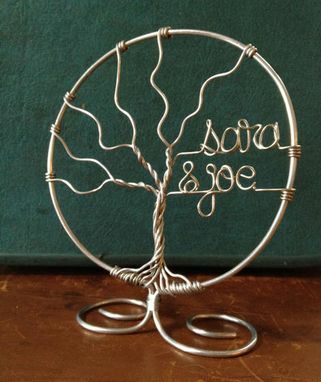 This unique "family tree" cake topper is the perfect way to showcase the beginning of a new union! 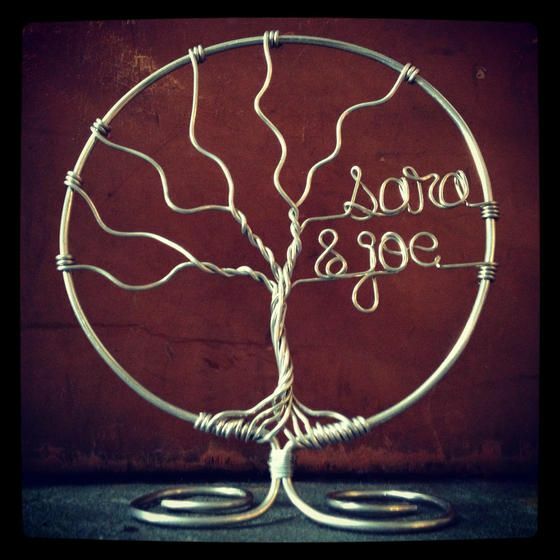 It will be delicately customized with the bride and groom's names, and formed with a base which allows it to be free-standing, giving you the opportunity to use it as decor in your home long after the Big Day! 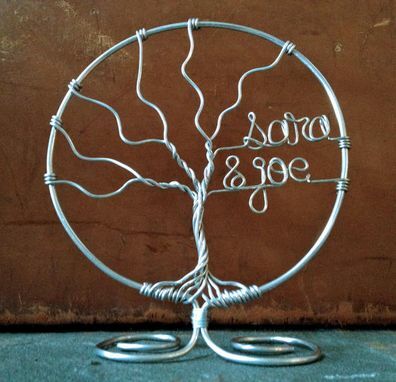 Due to size constraints within the topper, longer names will require a more oval frame, rather than a perfect circle. If you have concerns about the length of a name, please contact me to discuss. The topper shown here measures 5.5 inches wide, by 6 inches tall (with the base), suitable for a 6 inch cake tier. If your top tier is 8 inches or more, please inform me. All of my items are created with silver toned aluminum wire. 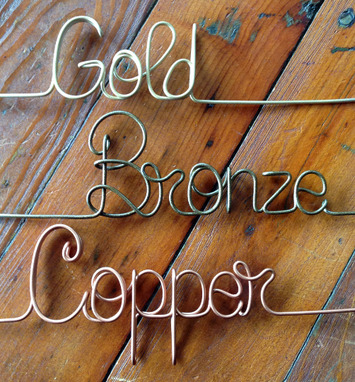 If you are interested in an alternate color, I am able to coat the finished piece with a metallic spray (gold, copper or bronze) for an additional $2. I work on orders in the order I receive them. Standard turn-around typically takes up to 3 weeks. (This does not include shipping time). I will accommodate rush requests for an additional $5. Rush requests are bumped to the top of my production list, and will be created within 1-3 business days after the order is received. You have the option of selecting rush production during the checkout process. All domestic orders are shipped via USPS Priority Mail, which take 2-3 business days in transit. Tracking information will be provided. If you're in need of a rush order with over night delivery, please contact me for a postage quote. All international orders are shipped via USPS First Class Mail. This option may take up to 3-4 weeks in transit. If your international order is needed sooner, convo me to discuss expedited shipping options. The buyer is responsible for any customs or duties fees upon receiving your package. Every maker has a story. Be a part of deliziare's story by placing an order, leaving a review, and seeing your review appear here.